Casa Guacamole is an authentic hacienda located in downtown Puerto Vallarta, just above the iconic Our Lady of Guadalupe Church, with tip to tip panoramic views of Banderas Bay from every bedroom in the home. At over 6,400 square feet, this 4 bedroom/5 bath Vallarta-style hacienda offers gracious common areas, heated pool, large balconies off every bedroom, and the best views found in Puerto Vallarta. If you are looking for the traditional charm of Mexico, along with modern amenities, Casa Guacamole is the luxury vacation rental home for you. 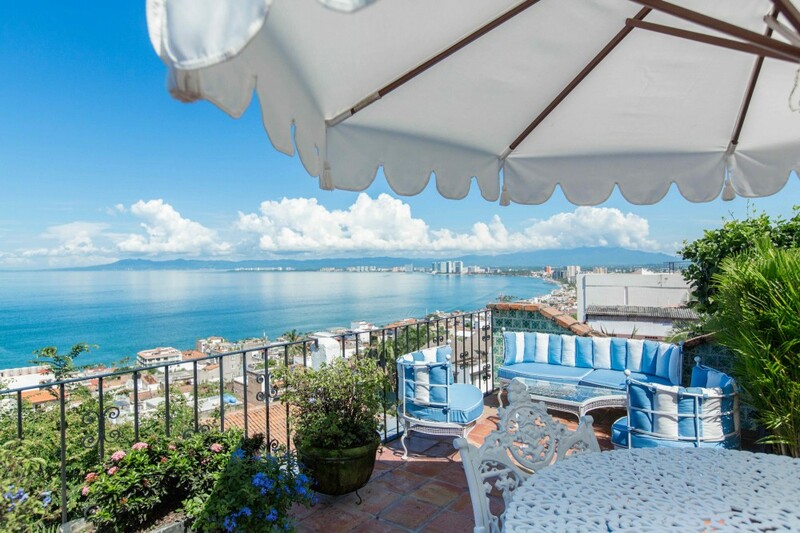 Featured on HGTV's House Hunters International ("Connecting in Puerto Vallarta", Season 104, Episode 3) and recently renovated. Casa Guacamole is staffed with two lovely ladies, Erika & Carolina, who provide housekeeping and breakfast cook service 6 days a week (Monday - Saturday, excluding Mexican holidays and check out day). They are also available to prepare lunch and dinner at a nominal fee. We offer pre-stocking services, and our concierge can arrange airport transportation, excursions, and in home massages, pedicures/manicures, facials, etc. The majority of the first level is open air - kitchen, dining area, outdoor pool dining, great room, heated pool, fountain, and built-in 8 burner grill. The first level also has air conditioned formal dining area & media room, as well as a full bath. Ascend up the tiled stairs to the second level to enjoy: master bedroom with large ensuite bathroom (open round shower with chandeliered cupola ceiling) and large balcony; middle bedroom, which has the ability to have king size bed split into 2 twins, with large bath (double sink, separate rooms for shower and water closet) just a step across the hall and balcony; third bedroom with two balconies and an ensuite which boasts double shower heads and double sink; and prayer area. The Penthouse bedroom is on the third level, with a huge terrace that offers stunning tip to tip views of Banderas Bay, and an ensuite bath with indoor/outdoor shower. Casa Guacamole offers wifi on the first level, air conditioned bedrooms, fine linens and towels throughout, and televisions/cable in all bedrooms and in media room. Our goal is to have your stay at Casa Guacamole to be the most special and memorable vacation possible. To that end, please contact us with any questions that you may have, so we can make that happen. Casa Guacamole is located in the "Gringo Gulch" area of downtown Puerto Vallarta. We are a few blocks above Our Lady of Guadalupe Church, and 6 short blocks to the Malecón. We are in the heart of Puerto Vallarta city center (El Centro), so restaurants/nightlife/shopping are extremely close. We are a 5 minute walk or short cab ride to the Romantic Zone. We feel that we have the perfect location - proximity to restaurants and shopping, but on the hill to maximize the view. We do have the option to sleep 2 more guests on a euro bed, set up in media room, for an additional charge of $50/person/night. For bookings cancelled 60 days or greater prior to check in date, we refund 50% of the deposit. If we are able to rent your time period to another guest, we will refund the remaining deposit. For cancellations less than 60 days prior to check in, we do not refund the deposit (deposit = 50% of rental fee + 50% of tax). Please review the rental agreement. Please message us with your dates & details. We will send a rental agreement for you to sign and scan back, along with a photocopy of your driver's license. To reserve Casa Guacamole and to be added to our calendar, we ask for 50% of the rental fees + 50% of the tax, at time of booking. This deposit can be paid by check, bank transfer, or PayPal (which incurs a 2.9% fee). The rental balance, tax balance, and $500 refundable security deposit are due 45 days prior to check in. At this time, we will send information about the services offered at Casa Guacamole. Closer to check in, our concierge will make contact to arrange airport transportation and offer excursions, in-home massages, facials, manicures/pedicures, etc. We are here to answer your questions and to make this the best vacation possible! Usually I am not lacking of words, however every previous review has described this most beautiful, unique, ethnically charming, local hacienda so vividly, that it is difficult for me to add some new details! This was my first visit to Pacific side of Mexico and Puerto Vallarta. I really did not expect this visit to be more relaxing and enjoyable than the Caribbean side. Yet, all I can say is WOW! The charm of the casa in the heart of town, uphill from Our Lady of Guadalupe is more than I ever expected. No, the photos do not give justice to the completely open air casa including the kitchen! The hills and steps at first were difficult for me, but by the end of the week, I loved walking everywhere around town! Had I returned to a resort (on the eastern coast) I would have only sat and lie all week never walking about town or doing anything different and adventurous! The pool is an added bonus that usually I do not like swimming, but it was sheer pleasure and relaxation to dip in the pool and sit poolside to read or just stare at the views when I did not want to leave the casa! I never closed my windows in my bedroom either; no bugs whatsoever! The bedrooms and bathrooms are beautiful and more than adequate. The sitting rooms and dining rooms are very tastefully decorated and comfortable. Every detail was intentional and not one missed! Erika and Carolina are very sweet, great chefs and more than agreeable to please you in every way. GREAT JOB CASA GUACAMOLE! Love love love! From the moment I stepped in, I knew I didn't want to leave. The entire house is impeccably decorated, and has everything you could ever want/need. The views from each floor are amazing and I loved waking up each morning to the open window breaze and the sun coming up above the water. I can't imagine staying anywhere else next time I visit puerto Vallarta with family. The two women who work there, Erika and Carolina, were so helpful and welcoming and made us feel right at home! Because we were in town it was easy to walk along the ocean and visit the great restaurants and bars in the area. As a young adult, i would not only love to return with family but would love to go back with my girlfriends. It's a great place for everyone to enjoy, relax, and explore! Beautiful home. beautiful views, beautiful food. Casa Guacamole sits high up on the hill from Our Lady of Guadalupe church, looking out over the ocean with exceptional views from all three floors. The casa has a beautiful open air floor plan with artistic Mexican flair and designer touches throughout. Flowers are everywhere throughout the house, the decks and around the pool. The owners thought of everything for a wonderful relaxing vacation, including wifi, info on restaurants and transportation, towels and beach bags for the beach, beautiful table settings for each meal, and Carolina and Erika who came in and cleaned everyday and fixed breakfast as well when asked. We slept in the penthouse at the top of the Casa where laying on the bed you are open to the ocean and the private deck. Amazing!!!! All of the bedrooms open out to the ocean with king sized beds and enough pillows for every guest's siesta. We would highly recommend this beautiful home!!! Sitting above PV, above Bandaras Bay, above Our Lady of Guadalupe, Casa Guacamole enchants its guests with a mirrored front door wearing a crown, referencing the crown cupola of Our Lady down the hill. What an entrance: expansive and filled with both light and dark , the interiors abut the pool, the sky and the bay. The outdoor dining room is surrounded by pots filled with flowers. It all flows together. Nothing looks off limits. We slept in the penthouse at the tiptop of the Casa. I plopped down on the bed and took photographs of our view: the terrace with private sunbathing and dining space just steps from the bed, overlooking the city and bay. We never used the beautiful blackout draperies or folding glass doors. We didn't want to miss a minute of that view. Carolina and Erika, our chefs, were engagingly present but not intrusive, preparing breakfast each morning and dinner the night we arrived. Meals were served on a beautiful table with colorful linens and place settings. The hosts have thought of everything: drink covers, coasters, even totes to take with you to hold your gear as you sightsee and shop, all sporting the CG logo. There are enough beach towels, warm throws, pillows for an afternoon nap for an army of guests. The hosts provide a book that answers every question about wifi, restaurants, transportation, and sightseeing. Even if you never leave the place, the architecture, interiors and the views of Puerto Vallarta will make your trip to Casa Guacamole a trip to remember. Comfort and options define the CG experience. Go. Enjoy. Repeat. Casa Guacamole sits on a cliff above Our Lady of Guadalupe in downtown Puerto Vallerta. The views of Bandaras Bay from this extraordinary property are stunning. The mansion takes full advantage of the breathtaking views from every open air space, window, and patio. A fine example of Mexican architecture, the Mansion houses high level furnishings and artwork. Also, it is minutes from the Malecon for family fun, restaurants, shopping, and night life. The well being of the clients is the owners' highest priority. Highly recommend. Absolutely Perfect Puerto Vallarta villa. Casa Guacamole will take your breath away! The location is fantastic - gorgeous views from every room and from the pool. Located within walking distance of shops, restaurants, the Malecon and sandy beaches, but perched high above a hill so that at night you can enjoy fireworks and the beautiful lit-up cupola of the Cathedral. The house is stunning - architecturally and decoratively. The open air kitchen and dining areas contribute to the vacation vibe, and we appreciated the lovely ocean breezes throughout the day and evening. Every detail is well thought out to maximize beauty and comfort. For example, in our wardrobe there were so many items available from a cozy, classic robe to an adorable towel wrap. There was even a really cool cozy poncho for breezy evenings! The linens and pillows are top notch and there is even an abundance of quick-drying towels for poolside. Erika and Carolina are the two friendly, charming women who will not only make you a delicious breakfast, but will serve it up so beautifully that you'll want to take a picture of it. (I know I did!) We had a wonderful stay at Casa Guacamole. We will definitely be back! Trip to a World of Luxury and Enjoyment! Casa Guacamole - "Pinch Me, I Must Be Dreaming!" Last year when our son and his fiance announced their March 2017 wedding date, we were very excited for them. And then they explained it would take place in Puerto Vallarta, Mexico. "Mexico?!" My husband and I were less than enthusiastic, but once we located Puerto Vallarta on a map, began our search for a place to stay. While the happy couple made arrangements for the wedding party and guests to book at a beachfront all-inclusive hotel, we decided to opt out. We wanted something different, something that said we were in Mexico. Our search led us to Casa Guacamole. The on-line photos and video were amazing, the four bedrooms made it perfect for us (we traveled with friends) and the idea that the house came with staff, seemed like a no-brainer. We arrived at PVR early afternoon, and were walking up the steps to the beautiful Casa Guacamole by 3:30. There are so many superlatives to describe our first impressions, but the only thing I could say at the time was, "Wow!" Followed by "Oh, my goodness." The open-air hacienda was unlike anything any of us had ever seen (world travelers among us). Traditional Mexican architectural elements abounded; hand-painted tiles everywhere, antique doors ("La Puerta") used as headboards, beautiful Talavera sinks, lovely and comfortable furnishings, splashes of colorful fabrics (my favorite Lilly Pulitzer prints added the unexpected). And then there was the view...day or night, none of us ever tired of gazing at it. Sunrises were nearly as lovely as sunsets (which were spectacular) and watching the changing colors of both the sky and waters of Banderas Bay, with frigates soaring above and below us, poolside conversations more often than not came to a halt. We quickly established a routine: coffee brewing at 6:30 for us early risers; Carolina & Erika arrived at 9:00 to prepare a delicious breakfast; off on a walking tour to explore The Malecon and points beyond, back up the hill for late afternoon Margaritas and a dip in the pool; showered and dressed in time to enjoy a fabulous dinner prepared by Carolina & Erika; up to the third floor balcony to watch the sun set and the lights of Puerto Vallarta to come up...several times we watched a movie in the living room, but leaving those wonderful views was always a challenge for me. (The wedding events took place at the end of our week.) All in all we were so happy to have had a more authentic Mexican experience that a hotel could have ever given us. I've stayed in other VRBOs and high-end hotels, but none top Casa Guacamole! This open-air hacienda is beautifully decorated with spacious bedrooms, bathrooms and multiple lounging areas. Because it's situated on hill above the bay, the views are breathtaking and can be enjoyed from the open-air kitchen, pool, and every bedroom. No detail was overlooked...from the attractive table settings to the colorful and plentiful turkish towels at the pool to the comfortable bedding and fluffy pillows. Carolina and Erika were a delight! Every meal they prepared was delicious and the extensive menu offered more selections than we had an opportunity to try. I can't wait to go back! This was my first experience in Puerta vallarta, and I couldn't have asked for a better place to stay!! As soon as I walked in I knew I would never want to leave. The home itself is nothing short of beautiful. Magical... heavenly... only a few words to describe this absolutely amazing home. The staff was extremely friendly, and accommodating. There for whatever you may need! The attention to detail is impeccable!! You will not regret your stay at casa guacamole. In fact, I can guarantee you'll be dying to go back!! From the moment we arrived at Casa Guacamole to the time we left, every detail was taken care of for us with impeccable precision. Erika and Carolina and their wonderful smiling faces were amazing, taking care of our every need. Not to mention their unbelievable cooking. I wrote down several recipes to try at home. The house itself is incredible - rooms are very spacious and airy plenty of space for our group of 8. The views are to die for and the pool was probably one of the warmest I've ever swam in (I'm a wimp with cold water) and definitely a hit with our family. The decorating is impeccable and there are little treasures and interesting things in every nook and cranny. I came home completely inspired to change the aesthetic of our home. Our stay at this house was glorious and I wouldn't have changed a thing. We have used VRBO for years and have stayed in many beautiful places but not once have I felt compelled to write a review. If you are looking for an authentic, gorgeous hacienda with space for everyone, this is it. My extended family of 8 stayed here for nearly 10 days and everyone from ages 8 - 78 LOVED this place and loved Erika and Carolina. My kids were besides themselves that there was a heated pool "almost in the living room"! Just go. Stay and enjoy every minute of it. You will never regret it! Casa Gaucamole is by far the nicest place I have stayed in a VRBO rental. It is extremely spacious and every detail has been thought of. From the bed linens to the plates and wine glasses every detail is beyond beautiful. For those who like to be adventurous the town, buses and shopping are only a few blocks down the hill. And if all you want to do is relax, the pool is amazing. We did a lot of both. Erika and Carolina are the friendliest and most talented chefs we have seen. They are the sweetest and most accommodating ladies. Our week in Puerto Vallarta was better than we could have imagined. If you need help getting around be sure to ask Miles. He is the perfect tour guide. We will definitely be back! 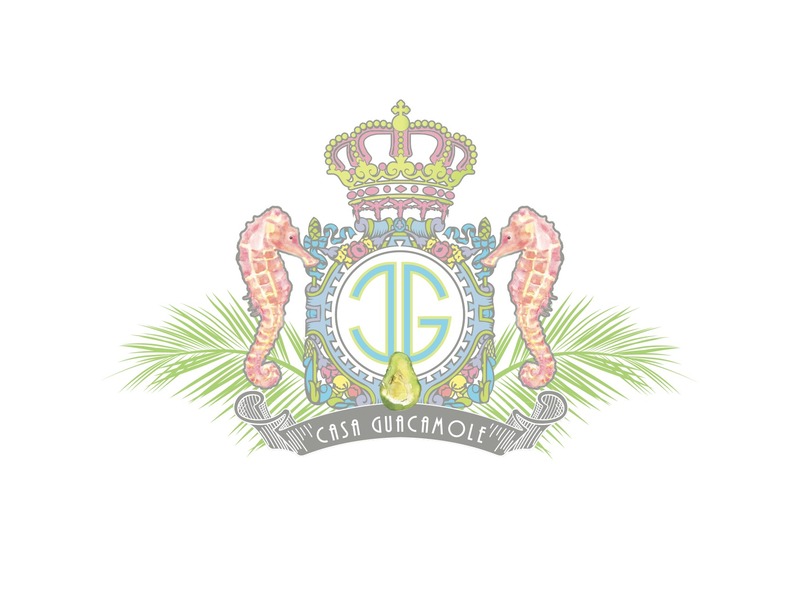 If you dream of the most fabulous accommodations you could possible imagine, Casa Guacamole is it! Everything is 10 stars, the house, the views, the staff of Erika and Carolina. The location close to most everything; just head 3 or 4 blocks down the steps. (For those of us who in our retirement years, a cab ride back up the hill was often a wise choice, just 50 pesos.) We arrived to a wonderful surprise in the refrigerator and then a beautiful prepared dinner by Erika and Carolina for a very reasonable charge. They cooked three dinners for us and each would compare to anything you found at a top restaurant. There are just not enough superlatives for Casa G. Everything you need or didn't even know you need is there waiting for your extraordinary vacation. However, everyone should be aware that there a lot of stairs in this Casa, but absolutely worth it! Absolutely beautiful!!!! Want to go back NOW:)!! We stayed at the casa for a girls trip. Honestly? I loved every thing about the house!! It is gorgeous and so easy to relax and have fun there. Highlights were Erika and Carolina who work for the owners and are just amazing. They are kind, hospitable and REALLY good cooks. It is worth every penny to have them prepare meals for you in the luxury of "your own home". The pool is perfect, the rooms and beds very comfortable. We loved the 'open air' atmosphere. The space is huge but at the same time you feel very cozy. In terms of location, we felt very safe. It was easy to walk to the market and downtown and waterfront. But at the same time, easy to cab it also - just make sure you have good directions to the casa because it is a hidden oasis and could be hard to miss. If you have any walking limitations I would suggest taking taxis because the walk up and down the old Puerto Vallarta streets can give you a work out:) The owner, Andrea, made sure we were connected to a gentleman in PV that could set up anything for us. Travel to/from airport, excursions, even in house massages by the pool!! I highly recommend Casa Guacamole and all it has to offer. What an amazing experience! The process of booking and planning our visit was made incredibly easy by the owners. Our entire group of 4 adults and 2 teenagers, were blown away by the style and grandeur of Casa G. We all instantly fell in love! The attention to detail with absolutely everything is a credit to the owners. The house Staff Christina and Erica were brilliant, we had there amazing breakfasts each morning, and also had them prepare 2 evening meals during our stay( highly recommend you should do the same). The properties location about 3 blocks up the hill from downtown PV, gives you a breathtaking view of the bay and town, but leaves you within easy reach. Each of the four bedrooms were spacious and immaculately designed. There was nothing we didn't enjoy about stay, and are already looking to plan our next visit. Thanks so much Andrea and Casa G, what an amazing experience! Go. Just Go. That's what I want to shout from the rooftop! Upon entering this incredible property, we were overjoyed with our planning. We were literally speechless as we entered the villa and were ushered up to our bedroom. Words simply cannot convey the grandeur of the view, the quality & high style of the furnishings, and yet the incredible comfort and relaxed atmosphere of this stunning home. The owners had arranged for their American son, Miles to meet us at the airport. How nice to have him chaperone us through the airport gauntlet and to the least expensive cab to be found! Miles was able to give us a quick overview of the area on the way to the Casa. From this point forward, we were relaxing in this amazing villa. It actually becomes difficult to decide where you want to be in this home! The large shaded circular "pit" area with the comfy couches and amazing views? The sunny pool deck with lounge chairs and amazing views? Sitting at the cutest bar stools ever, at the counter of the open air kitchen. Or your own large, breathtaking bedroom with seating areas and plush King size beds, with even better views of the entire Bay of Banderas. Pinch me, we must be in a movie, or at least an advertisement from Conde Naste Best Places to Stay in the world! Except the price is so reasonable that you wonder what could be the catch? And as the week unfolds you realize that there is no catch . . . just the magic of this STYLISH, lovely home and the charm of PV that has captured your heart. A huge bonus: I slept better than I do at home. The open air was perfect in January, but the louvered bedroom doors close in the evening and AC can be turned on if you prefer total climate and light control. Prior to this trip, my experience had been that all beds in Mexico are made of concrete. NOT true we discovered after staying at Casa Guacamole!! Deliciously comfortable, clean and pampering in every way. And I haven't even started on the actual activities we enjoyed while in exciting and beautiful PV. I highly recommend that you read the owners Welcome Binder from cover to cover for insight and fantastic suggestions for dining and activities. For us, lunch at the Ocean Grill and private beach was a HUGE highlight, as was whale watching. The charm of the location - cobblestone streets, old world and new world colliding, Erika and Carolina's breakfast and smiles, GREAT dining nearby, and the feeling of safety yet adventure. A perfect vacation! Casa Guacamole is by far the most beautiful rental home we have ever had the pleasure of staying. As others have already reviewed, the layout is lovely; plenty of room for a group to spread out or be together. The decor is stunning, and the attention to detail is that of a 5-star hotel, except it is all yours! Much of the casa is open air, so you feel as though you are part of the outdoors, and the view of the bay is absolutely breathtaking from every bedroom and also the lovely pool area. Erika and Carolina, the women who take care of Casa Guac are friendly and welcoming, and prepare a gourmet breakfast every morning. Each bedroom is more lovely than the next, with luxurious linens and comfy beds, with air conditioning and ceiling fans. We felt completely pampered at Casa Guacamole. The owners are very attentive and helpful with any questions you may have about staying there. CG is situated close to many restaurants, bars, banks, gyms and shopping, and cabs are plentiful and inexpensive if you'd rather get a lift anywhere. Our family of five stayed over Christmas, which included adults and teenagers; all of us agreed that this was by far the nicest place we have ever stayed! What a wonderful, beautiful home for us to spend our holiday! We stayed here for a week with friends. From the moment we booked until we arrived the level of attentiveness was outstanding and appreciated. Upon arrival we were in awe of the casa, which was even more amazing than the pictures. The staff are nothing short of incredible and the casa is comfortable, luxurious and relaxing. They helped us to book a spa day and gave great recommendations for shopping and restaurants. Transportation to and from the airport was straightforward as we booked through them. Simply amazing and highly recommended for couples. You will not be disappointed!!!! Casa Guacamole, A name and a home you can't forget. Great home, great view, and great service. Erika and Corolina are the best. The owners are extremely attentive and go beyond the normal expectation. Yes real owners not a rental company. The home is true hillside hacienda. so if your looking for the real Mexican feel, this is it. Top notch all the way. Can't wait to go back. Casa Guacamole took our breath away as soon as we walked in the door. We loved the indoor/outdoor living space. It allowed us to enjoy the spectacular view of the ocean and the breeze. With our kids, we took full advantage of the pool. Erika and Caroline are wonderful cooks - definitely the best meals we had in Puerto Vallarta. The location is also great - just steps away from old town and the boardwalk by the ocean. It's also not a far walk to a beach. We all just loved it and would highly recommend it to anyone. This was by far the best family vacation we have ever experienced. We had ten people including two toddlers and ages ranging from 2 to 70, and everyone loved the experience! The house was beautiful with ample accommodations for all. The two women who cooked our meals and served us were wonderful and the food was terrific. Everyone enjoyed the pool and the views, and we also took advantage of the local activities including fishing, zip lining, ATV tour, dolphin swim and the beach. I would heartily recommend a stay at Casa Guacamole to anyone who wants a dream vacation to Mexico.